The Resource-Based View (RBV) is a perspective that examines the link between a company’s internal characteristics and its performance. RBV is therefore complementary to the Industrial Organization (I/O) perspectives that look more at external factors in order to determine performance and competitiveness potential (e.g. Porter’s Five Forces). The supporters of RBV argue that organizations should look inside the company to find the sources of competitive advantage instead of looking at the competitive environment. The key concepts within this view are therefore Firm Resources and Sustainable Competitive Advantage. Firm resources can be defined as ‘all assets, capabilities, organizational processes, firm attributes, information and knowlegde controlled by a firm that enables it to improve its efficiency and effectivieness’. Resources are often classified into categories such as tangible (e.g. equipment, machinery, land, buildings and cash) and intangible (e.g. trademarks, brand reputation, patents and licenses) or physical, human and organizational resources. 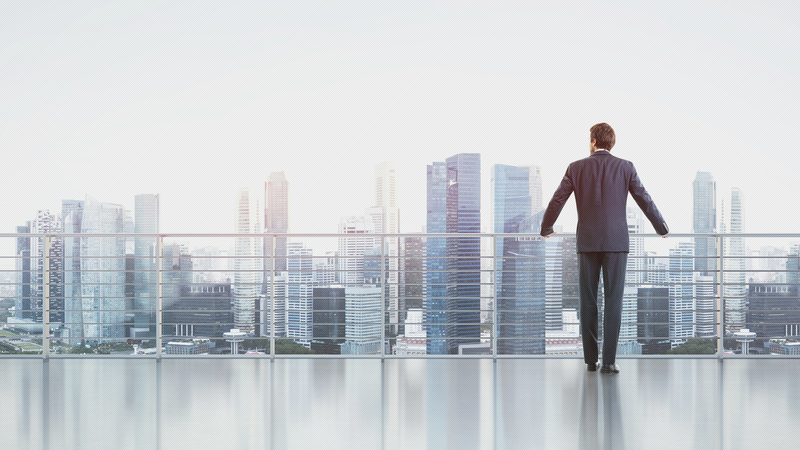 In order for companies to transform these resources into sustainable competitive advantage, resources must have four attributes that can be summarized into the VRIO framework. First and foremost resources must be valuable. According to the RBV, resources are seen as valuable when they enable a firm to implement strategies that improve a firm’s efficiency and effectiviness by exploiting opportunities or by mitigating threats. Another way to assess whether a resource or investment is valuable is by looking at its Net Present Value (NPV), meaning that the costs invested in the resource should be lower than the expected future cash flows discounted back in time. If non of the resources possessed by a firm are considered valuable, the focal firm is likely to have a competitive disadvantage. Secondly, resources must be rare. Resources that can only be acquired by one or few companies are considered to be rare. If a certain valuable resource is possessed by a large amount of players in the industry, each of the players has a capability to exploit the resource in the same way, thereby implementing a common strategy that gives non of the players a competitive advantage. Such a situation is indicated as competitive parity or competitive equality. In case a company does possess a large amount of resources that are valuable and rare, it is likely to have at least temporary competitive advantage. Unique historical conditions: choices made in the past influence the options a company has in the present and future (path-dependency). Similarly, a company that has located its facilities on what turns out to be a much more valuable location than initially anticipated, has an imperfectly imitable physical resource. Causal ambiguity: causal ambiguity exists when the link between the resources controlled by the focal company and its sustainable competitive advantage is not fully understood. Competitors won’t be able to duplicate the focal company, since they simply don’t know which resources they should imitate. Social complexity: if the most important resource of a company is a combination of the strenght of its social network, interpersonal relations, a company’s culture and its reputation among both suppliers and customers, it is very hard for competitors to build an identical social network since it is dependent on so many different factors. If a company’s resources are both valuable, rare and inimitable due to the reasons mentioned above, the focal company has a high potential to gain a competitive advantage that is sustainable over time. There is however one more important criteria that needs to be present within the company. The resources themself do not create any advantage for a company if the company is not organized in way to adequately exploit these resources and capture the value from them. The focal company therefore needs the capability to assemble and coordinate resources effectively. Examples of these organizational components include a company’s formal reporting structure, strategic planning and budgeting systems, management control systems and compensation policies. Without the correct organization to acquire, use and monitor the resources involved, even companies with valuable, rare and imperfectly imitable resources will not be able to create a sustainable competitive advantage. When all four resource attributes are present, a company is save to assume it has a distinctive competence that can be used as source of sustainable competitive advantage. 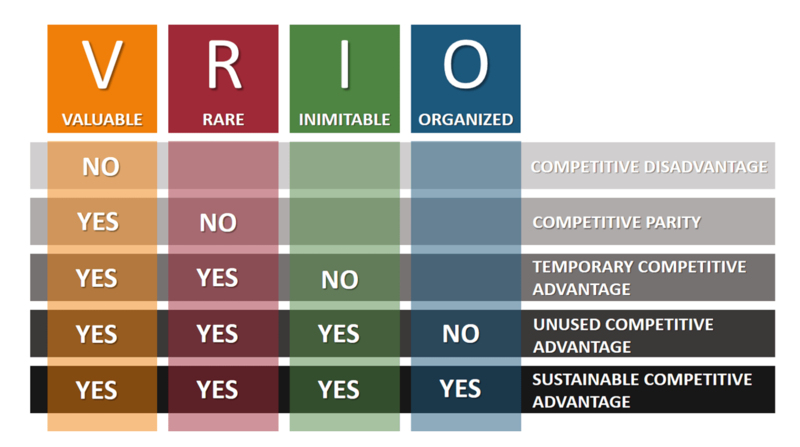 Below is a diagrom that sums up the four VRIO attributes and the resulting advantages the company has in different situations. Note that the VRIO framework is a follow-up of the VRIN framework (Valuable, Rare, Hard to Imitate, Non-substitutable). The creator of the VRIN and VRIO framework, Jay Barney, combined the I and N into one attribute and added the O as extra criteria. 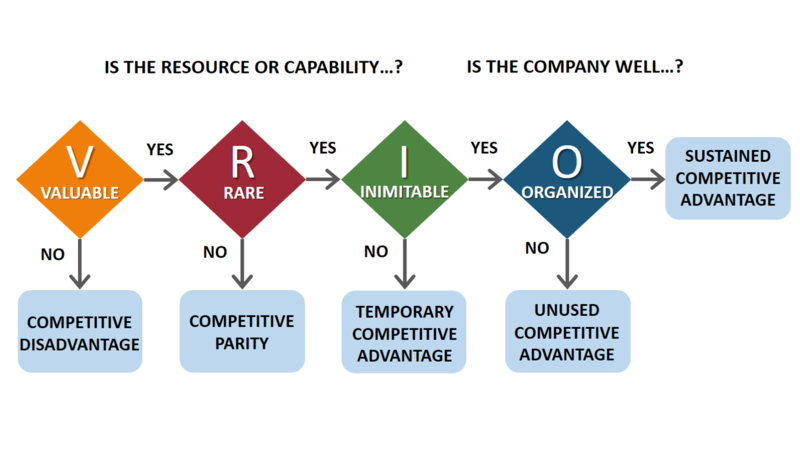 Inimitability in the VRIO framework therefore means that resources are hard to imitate because competitors cannot duplicate and/or substitute them. It is recommended to combine this framework with Porter’s Value Chain Analysis in order to create a more complete overview of the strengths and weaknesses of the organization’s internal factors. Barney, J. (1991). Firm Resources and Sustained Competitive Advantage. Journal of Management. Wernerfelt, B. (1984). The Resource-Based View of the Firm. Strategic Management Journal.